Pastor Cheung Yu returns to his hometown, a metropolis where he reunites with his childhood friend Ho Cheong. Hunchback granny Chan Hei ekes out a living by scavenging while taking care of her bedridden husband Tsui Fuk.An apparent assault connects these four people. Can our society, which emphasizes justice and honesty, also embrace mercy andforgiveness? A once-glittering city has lost its lustre. The cruel realityburies a kind-hearted human being. The law maintains stability in society, but who protects people’s souls? 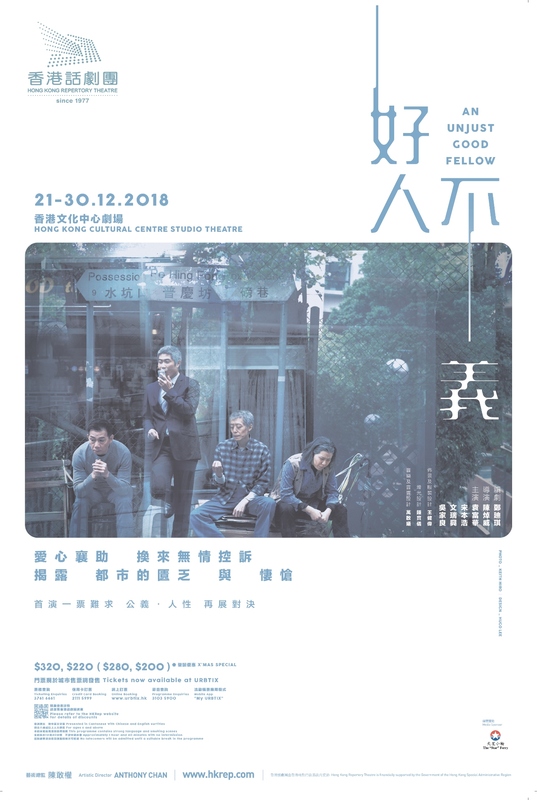 An Unjust Good Fellow, whose premiere appeared in The Open Platform in 2017, received rave reviews from the media and audiences alike, resulting in sold-out houses. For this revival, we invite Octavian Chan to direct on our Main Stage, where the audience will come face to face with a battle between legal reasoning and human bonds, pondering such definitions as justice and mercy.